The map shown above was hand-drawn from memory in 1974 by Hubert Walker who emigrated to Canada from Plumtree in 1927. Hubert Walker was born on 11 May 1913 and was baptised in Plumtree Church on 15 June 1913; he lived with his parents, his brother and three sisters in Bradley’s Farm. The Walker family emigrated to Quebec in April 1927. 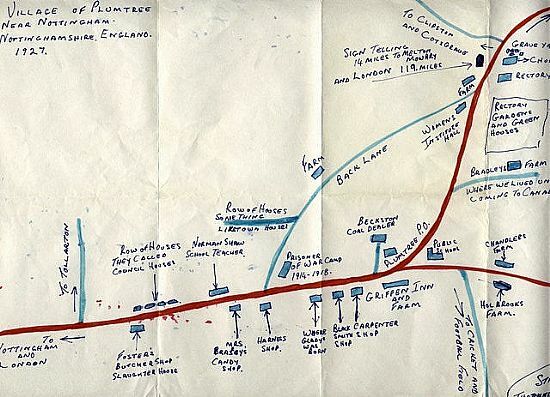 In 1974, Hubert’s son Donald Walker paid a visit to Plumtree, for which his father prepared this map for him from memory. It depicts the village as Hubert remembered it in 1927. Donald Walker paid a further visit to Plumtree in May 2013 and Plumtree resident Ken Bloor chanced to meet him in the churchyard. Following their conversation Ken and Donald exchanged emails, one of which from Donald contained this intriguing map and some photos.